Schinus areira L. (syn. Schinus molle L. var. areira (L.) DC.) belongs to the Anacardiaceae family, native to South America, now widely distributed in temperate zones of the world, known as “aguaribay”, “árbol de la pimienta”, “pepper tree”, “terebinto” or “pimentero”. It is considered a medicinal plant in the folk medicine and it is also appreciated by its culinary properties. Its fruits are used as a spice and to prepare a popular drink named “chicha”. These popular uses have stimulated a number of biological and chemical studies. This communication offers a general view of the structural characteristics of the secondary metabolites isolated from S. areira L., as well as their ethnomedicinal uses, biological activities and toxicological considerations. Keywords: Schinus, Anacardiaceae, biological activity, secondary metabolites, traditional uses, medicinal plants. 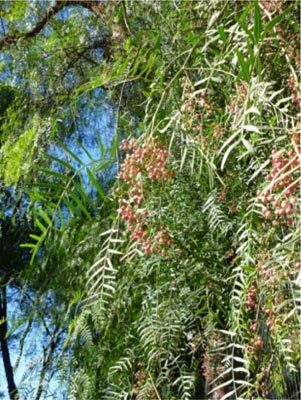 Keywords:Schinus, Anacardiaceae, biological activity, secondary metabolites, traditional uses, medicinal plants. Abstract:Schinus areira L. (syn. Schinus molle L. var. areira (L.) DC.) belongs to the Anacardiaceae family, native to South America, now widely distributed in temperate zones of the world, known as “aguaribay”, “árbol de la pimienta”, “pepper tree”, “terebinto” or “pimentero”. It is considered a medicinal plant in the folk medicine and it is also appreciated by its culinary properties. Its fruits are used as a spice and to prepare a popular drink named “chicha”. These popular uses have stimulated a number of biological and chemical studies. This communication offers a general view of the structural characteristics of the secondary metabolites isolated from S. areira L., as well as their ethnomedicinal uses, biological activities and toxicological considerations.